Before Installing this Add-in make sure your Xamarin Studio version is at least 5.9.5 or above. Enter emdk in the search box in the top right corner of the Add-in Manager. As you type in the search box, the Add-in manager will filter out all add-ins except EMDK for Xamarin. Now click the Install button in the bottom left corner of the right hand pane. Then select Install in the next dialog. You will likely see an error message stating that the install failed. This is a known issue, and will be addressed in later revisions of the Xamarin Studio. The Add-in is now installed, we just need to restart the IDE for the EMDK menu to be displayed. Click the close button for that dialog, then click the Close button for the Add-in Manager. Restart Xamarin Studio and you will see the EMDK menu on the Menu bar. Click the Uninstall button in the bottom left corner of the right hand pane. Click the Uninstall button in the next dialog. > You will likely see an error message stating that the uninstall failed. This is a known issue, and will be addressed in later revisions of the Xamarin Studio. The Add-in is now uninstalled, we just need to restart the IDE for the EMDK menu to be removed. 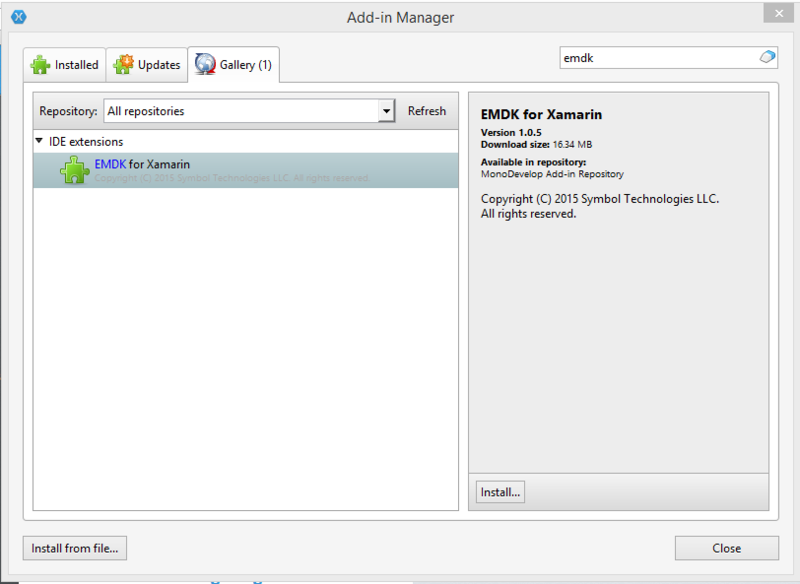 Restart Xamarin Studio and you should no longer see the EMDK menu on the Menu bar. The IDE Add-in copies support files to the your file system in order to perform tasks such as Device Runtime Install. To clean up the support files do the following.